About once a month or so, I like to make a quiche. Sometimes I’ll bake my own pie crust, but other times, when I’m in a hurry, I’ll use a pre-made one from the store. The thing I love about quiche is its timelessness. It can be enjoyed at breakfast, lunch, or dinner. I’ve even eaten a cold slice as a snack in the afternoon! It’s also a great way to use up old and leftover ingredients. 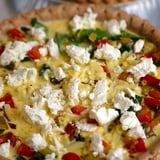 This Mediterranean-inspired quiche is my latest favorite recipe. It’s a perfect easy meatless meal, and it’s so good you may end up eating half of one quiche in a sitting! The filling is a combination of sautéed onions, zucchini, red peppers, and sun-dried tomatoes; gruyere and goat cheese provide a luxurious richness. Using clarified butter will help the onion caramelize quicker, but feel free to use standard butter if you do not have any clarified butter available. The quiche pictured has whole wheat pie crust, but that’s entirely optional. Regular pie crust will work too. Preheat oven to 375ºF. Put pie crusts in pie tins if necessary and place them on a rimmed baking sheet. In a large skillet, melt butter over medium-high heat. Add onions and cook, stirring occasionally until caramelized, about 6 minutes. Add zucchini and cook until zucchini is soft, about 6 minutes. Add red pepper and cook, stirring occasionally, until vegetables are wilted, about 4-6 minutes. Turn off heat and stir in tomatoes, basil, and thyme and season lightly with salt and pepper. Set aside to let cool. In a medium-sized bowl, beat eggs and half-and-half together. Add salt, pepper, grated gruyère, and crushed red pepper. Divide vegetable mixture between two pie crusts, then pour egg mixture over each. Crumble goat cheese over tops. Bake for 45 minutes, or until set and cheese begins to brown on top. Remove from oven and cool for 30 minutes before serving.